The word "levo" as derived from Latin, means 'to raise, lift up, relieve, or ease'. This is precisely what the Levo Bookholder & Book Stand does for you. This sturdy, aluminum floor stand relieves the stress and strain of having to hold your book; resulting in a more comfortable, ergonomic and relaxing reading experience. Looking down to read a book can be a source of neck discomfort and may lead to arthritic degeneration affecting discs in the lower neck over the long term. 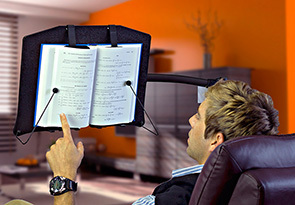 Levo G2 Book Holder offers a state-of-the-art ergonomic solution. The stand lets you conveniently set the location of a book at your eye level, regardless of your preferred reading position. This assures the Levo user efficient, comfortable, hands-free reading. COOKING GUIDE AND RECIPE HOLDER: a parent cooking for their family or in-home culinary artist needs two things: 1) every inch of available counter space and 2) hands that are free to go to work. Levo provides both while keeping your favorite cookbook high, dry and out of the way. Bon apetit! DESIGN AND FUNCTIONALITY: Levos groundbreaking design offers virtually infinite positioning and the ability to support a book weighing up to four pounds in any eye-level of your choosing...even upside down. Our quality review team researched the market using a comprehensive set of protocol that explored ergonomics, reader feedback, popularity and functionality; all-inclusive of book holders, book stands and/or reading floor stands. The results proved Levo to be the best book holder and book stand available. Whether you're reading the latest best seller, studying or perusing your favorite magazine, we're certain you'll delight in the comfort and user friendliness of your new bookstand. Use for reading in bed, a chair, or favorite recliner. STUDY OR READ WHILE YOUR EXERCISE: Forty minutes on the exercise bike can seem like forty days when all you have to look at is a blank wall staring back at you. Place the Levo Book Stand in front of you with a pictorial history of a faraway destination and you're on your way. Rest assured that the Levo Book Holder easily adapts to your specific needs in just about any reading environment. You owe it to yourself to choose wisely. Our research of many ergonomic bookholders has proven Levo to be the best book stand available. Use it for books, magazines, paperbacks; even your heavier reference guides (up to 4 pounds). 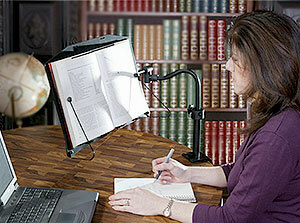 The patented, easy-to-use bookstand has a sturdy aluminum design with quick-lock adjustment. Every Levo has a 3-year limited warranty. Reaches Over Your Favorite Chair/Recliner: 24.5" from pole to middle of book board platform (or 18" from edge of base to middle of book board). Minimum height: 30″ above floor (measured from bottom of book). Maximum book weight capacity: 4 lbs. The Levo Desktop Book & Tablet Holder is a clamp-on model offering 5 unique movements to perfectly place your book, copy, tablet, book reader or iPad in the most comfortable, ergonomic reading position for your desk, worksurface or side table. The sturdy aluminum construction with a maximum weight capacity of 4 lbs., can hold it all; including large reference books. 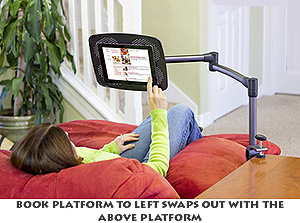 Tablet platform holds tablets and readers up to 11″ wide. The Desk-top Model easily clamps to work surface or tables from 1/4″to 2″ thick. Power for tablets is not available on this model. We are offering a combo of interchangeable platforms for both the tablets and books in one desktop model price. Minimum height: 5 1/2″ above desk (measured from bottom of book). Maximum weight capacity: 4 lbs. DELIVERY: This product is shipped from the manufacturer and may take from 3-7 days to receive. WARRANTY: the Levo Book Stand/Book Holder has a 3-year limited manufacturer's warranty. 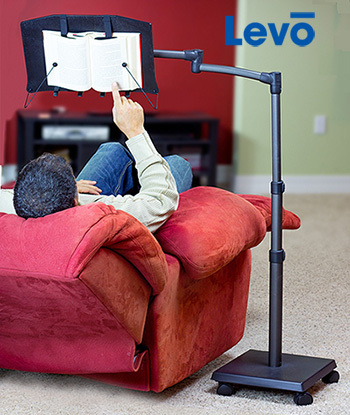 Levo G2 Tablet Stands | Adjustable | Ergonomic Floor Stand - Whether sitting, standing, lying in bed or on a treadmill, Levo Tablet Holder Stands are easy to adjust, strong and usable with tablets, iPads and book readers.